This demo surveillance video demonstrates day and night time infrared capability of the AHD-D32W Dome 1080p AHD CCTV Camera. This high definition 1080p video surveillance footage was recorded using an AHD-D32W dome security camera. The camera is ceiling-mounted in the corner of CCTV Camera Pros test studio. This room is 29 feet wide by 22 feet deep. I temporarily turn this floor lamp on so that I can make my way back to this spot after I turn the main lights off. When I turn all of the lights off in the room, the camera automatically turns its infrared LEDs on and engages the IR cut filter so that it can record black and white surveillance video in complete darkness. The smart infrared technology used by this camera ensures an even illumination of the entire room and also makes sure that objects do not get whited out when they are close up to the camera. I turn the floor lamp back on again so that I can make my way back over to the light switch. When I turn the main lights back on, the camera disengages the infrared mode and captures video surveillance in color again. The D32W is an AHD CCTV camera. To record video, this camera must be used with an AHD-compatible DVR. The AHD-D32W captures full 1080p HD video. The 2.8 to 12 millimeter varifocal lens allows installers to adjust the angle of view between 106 and 26 degrees. This is an indoor dome camera with a tri-axis lens mount to accommodate ceiling and wall mount installations. The smart IR technology ensures a nice even illumination for the entire picture. The intensity of the infrared LEDs automatically adjusts as people move closer to the camera so that their appearance does not get washed out from overexposure. 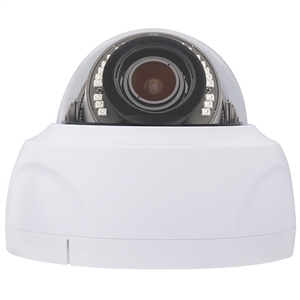 CCTV Camera Pros supplies this camera for home, business, and government surveillance systems. To learn more, please visit www.cctvcamerapros.com/d32w. Thank you for watching. Click here to learn more about the AHD-D32W Dome AHD CCTV Camera used in this video.